Tired of being overweight and out of shape, Tate Confer decided to take his fitness into his own hands. With his family's help, he transformed his body and embraced a new, healthy lifestyle. I decided to transform because I grew up an overweight child, and finally decided it was time to change the unhealthy lifestyle I was leading. I was just tired of being out of shape. I knew training and dieting would improve how I looked—and more importantly, how I felt. My family was very supportive of my decision to become fit, and they did everything they could to help me along the way. My mom would prep healthy dinners, my dad would order supplements from Bodybuilding.com, and my brother would train with me. My life now is leaps and bounds different from before my transformation. I currently train every day, and eat foods that will benefit my body and mind. Before, I rarely trained, and consumed a lot of processed foods that took me down an unhealthy path. When I started my transformation, I knew very little about training and nutrition, so I had to educate myself on the correct way to do both. I read many articles online about diets and different training methods that would further my progression and allow me to better my physique. I never thought about quitting, because I loved every day of training and the way it made me feel and look. Seeing progress kept me extremely motivated to continue my fitness journey, and made it easy to continue this new lifestyle. I found motivation in fitness icons I saw online and in magazines, such as Frank McGrath and Antoine Vaillant. In my opinion, your diet is the most important aspect of your fitness journey. It wasn't until I was fully committed to learning about nutrition and following my diet that I saw the results I was looking for. It's crucial to educate yourself on the large variety of diet plans that exist, and find the one that best suits your health goals. I knew I wanted to lose weight and have a lean physique, so I would read articles and watch videos on how to accomplish this. My training regimen is very high-volume and consists of methods such as dropsets, rest-pauses, and supersets. It's important to me that I force as much blood into the muscle as possible, and achieve the greatest pump I possibly can. I work in the 12-15 rep range on almost all of my accessory lifts, and only work in the 3-5 rep range on my heavy core lifts such as bench, deadlift, and squat. I follow a 6-day split, and do cardio every morning before my first meal. These workouts usually take about 2-1/2 hours to complete. The most challenging aspect I faced when it came to leading a healthier lifestyle was sorting through the vast amount of information and advice that exists in the fitness community, and finding what would personally work best for me. It can be extremely overwhelming to try to figure out which diet or training split you should follow, because there are so many opinions and different variables that come into play when making those decisions. I knew I had to rely on trial and error until I found a combination of supplementation, nutrition, and training that best suited my fitness goals. I competed in my first men's physique this past March, and plan on continuing to do so. I was the youngest competitor in the show by a wide margin, and placed 13th out of a group of 30. I hope to place top 5 in my next show, and hopefully receive a supplement sponsorship in the near future. "I knew I had to rely on trial and error until I found a combination of supplementation, nutrition, and training that best suited my fitness goals." It's never too late to start leading a healthy lifestyle. Do what works best for you. The amount of advice and info you will receive could become overwhelming if you let it. Just remember to follow what feels right. Don't get discouraged. A successful transformation takes time, so stay patient and I guarantee you will see results. Bodybuilding.com has been a tremendous help throughout my fitness journey. 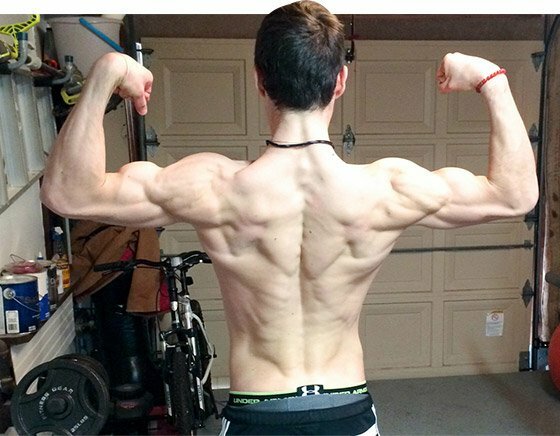 Whether it is supplements, forums, or just a way to view what is happening within the fitness community, Bodybuilding.com has always been my go-to website. Without this website, my transformation and overall goals would have been more difficult than they were. Also, BodySpace is a great way to network with other fitness enthusiasts who can help you to further your knowledge of training and diet.